With society touting the idea of spending two months' salary on an engagement ring and elaborate designs becoming trendy and expensive, many couples struggle to find affordable engagement rings. Before giving up searching for the perfect ring, realize that there are many options available to help you find a stunning ring that will symbolize the beginning of your new life together. Rings can be found in a variety of prices. You can find engagement rings priced from less than $100 to well over one million, depending on the style, stones, and designer. Many attractive engagement rings can be found for under $1,000 for couples on a tighter budget. The following ring options are examples of beautiful but lower-cost rings. Golden Mine features the Sterling Silver Micro Pave Ring priced just under $85. This ring uses a cubic zirconia as the center stone and sets it in a high polish sterling silver setting accented with micro pave diamonds. Ice features the 1/8 Carat Diamond 10K Yellow Gold Ring. This ring, just under $400, has a cluster of diamonds set in gold and is reminiscent of the classic Hollywood style. Jewelry Central has the 14K White Gold Cathedral Engagement Ring priced at $475. It has a princess cut diamond is set in a classic cathedral style setting. Diamond Harmony features the 1/3 Carat White Gold Grand Royal Prong Ring priced at $810. 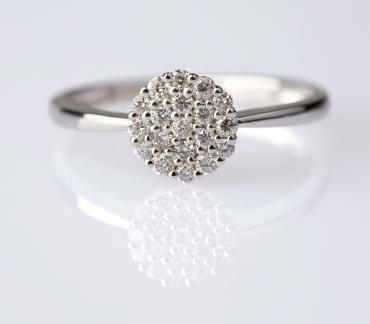 Set in 14K white gold, this ring contains 28 sparkling round diamonds. World Jewels has the elegant 1/2 Carat Diamond Engagement Ring priced just over $800. 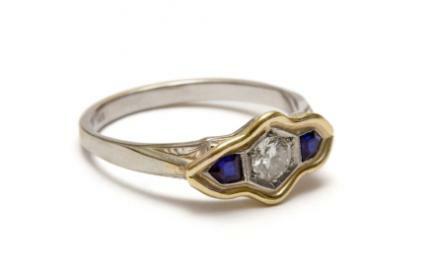 This ring has an oval center stone and can be done in either gold or platinum. The diamond is the single most expensive piece of an engagement ring, and a diamond's cost is directly affected by the four Cs: color, clarity, cut, and carats. For affordable rings, consider using each of the four Cs to trim the overall expense. Color: While colorless stones are the most desirable, they are also the most expensive. To the naked, untrained eye, stones with slight color (a yellow or brown hint) are virtually indistinguishable but they are far less costly. Clarity: Large flaws may detract from a stone's beauty, but some flaws can actually be incorporated into the stone for a stunning starburst or other distinctive effect. Furthermore, recessed settings such as bezels or flush settings can conceal small flaws, making those diamonds a more affordable choice. Cut: Round, brilliant cuts are the most popular for engagement rings, and they are also one of the most affordable because of their wide availability. On the other hand, princess and Asscher cuts are more rare and expensive - to cut costs, opt for traditional shapes. Carat: The carat weight of a diamond may be the most cost-effecting characteristic of all. If a large diamond is desirable, consider a solitaire rather than an accented ring to concentrate the total weight in a single stone. Also consider using small stones in unusual settings such as clusters or figural designs to highlight the stones and conceal their size. High settings such as prongs will also accentuate smaller stones. There are many affordable engagement rings other than diamonds. Many couples choose birthstones or other semi-precious gemstones, a decision that can drastically reduce the ring's cost while adding immeasurable uniqueness and symbolism to the jewelry. Celtic engagement rings are another beautiful and distinctive choice, and without gemstones they can be more affordable. Claddagh rings are also highly symbolic and can be less expensive than traditional rings. The key is for the couple to find the perfect ring not only for their budget, but to represent their relationship and personal tastes. What is affordable for one individual may be either too cheap or too exorbitant for another. Defining "affordable" depends entirely on the couple's unique budget and their anticipated expenses. For a couple that is also considering buying a house, continuing their education, or planning for other high-priced expenses, an expensive engagement ring may be out of the question. Whether a couple wants to conserve funds or simply wants a less expensive ring, affordable rings are easy to find if they know what to look for in terms of quality, style, and design. From classic looks to contemporary pieces, it is possible to find the perfect engagement ring without breaking the bank.